Mark Morris Dance Group/Dance for PD has partnered with Inspirees International B.V. to develop Dance for PD-based training opportunities and community classes throughout China over the next five years. The initiative, which has been in the incubation stage for more than a year, launched this May 5-7 with an introductory teacher training workshop, medical presentation, film screening, and community class at Zhongshan Hospital in Shanghai. More than 25 trainees from China, Hong Kong, Singapore and South Korea participated in the workshop, which is the first step of a full training course that will continue with online coursework, professional development, and Dance for PD Certification. 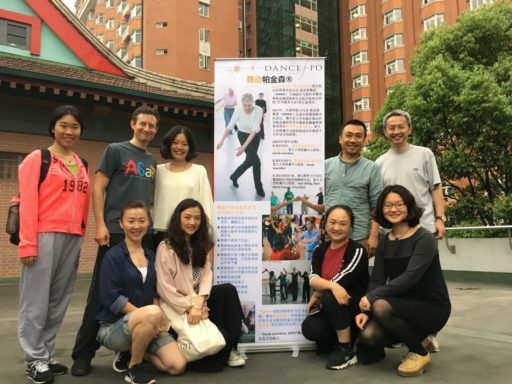 At a medical presentation on May 5, Leventhal explained the rationale behind the program to hospital staff before leading a spirited Dance for PD demonstration class for 15 members of the Shanghai Parkinson’s community. Inspirees Institute of Creative Education (IICE) established by Inspirees International B.V., is an international training institute specializing in creative education. Based in the Netherlands and China, IICE runs various programs in different places in the world. IICE’s mission is to facilitate personal growth via integration of the human body and mind, with the goal of becoming a leading institute in the field of creative education with a world-wide reputation. Inspirees Institute of Creative Arts Therapy (IICAT), affiliated with IICE, offers the dance therapy certificate program which is in compliance with the American Dance Therapy Association (ADTA) alternate route training guideline. In September, Dance for PD and Inspirees will be co-presenting a second introductory workshop in tandem with the International Symposium of Behavioral Medicine, which will feature presentations from experts in psychosomatic and dance movement therapy from China and abroad. The May and September training cohorts will continue their coursework in 2018 with the goal of having a team of certified teachers by the 2018-2019 season. Community classes will start in Shanghai and Beijing, with additional cities coming online as relationships develop. For more information about Dance for PD China, please click here. Photo: The leadership team for Dance for PD China, including David Leventhal, Ocean Lee and Tony Zhou (back row), along with community member James Wang and Inspirees staff.